Bossy Sims was a cow owned by George W. Sims in the 1860’s. At that time Sims was the superintendent of an incline railway at Prospect Point that took tourists down to the base of the American Falls. He lived near the railway and apparently let the cow graze in the area. Bossy would frequently wade out into the dangerous waters above the American Falls often within 100 feet of the crest. On at least one occasion she reportedly made it all the way to Goat Island. Bossy became an unexpected and surprising attraction to tourists of that time. 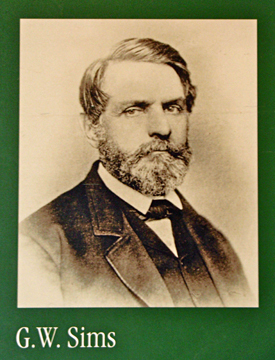 As a boy George W. Sims and his friend Berry H. White are credited with discovering the Cave of the Winds in 1834. The cave was located behind the falling waters of the Bridal Veil Falls. It was quickly commercialized and was a major tourist attraction until it was closed in 1921. In my waterfall explorations I have learned of another Daredevil cow from Wyoming County, NY. 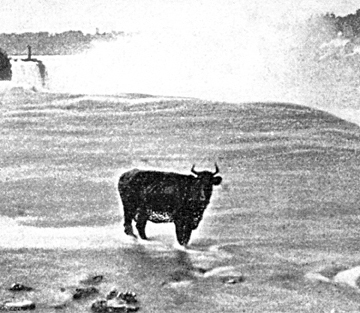 The landowner mentioned that one of his cows would often be found standing in the shallow creek bed a few yards from the crest of a 47 foot high waterfall. Sometimes he had to coax the cow from the creek and back into the barn. One day he found the cow dead at the bottom of the falls.